Fits all late B6 A4 1.8t engines From VIN #8E 4 191 001, split is in model year 2004 with AMB engine code. 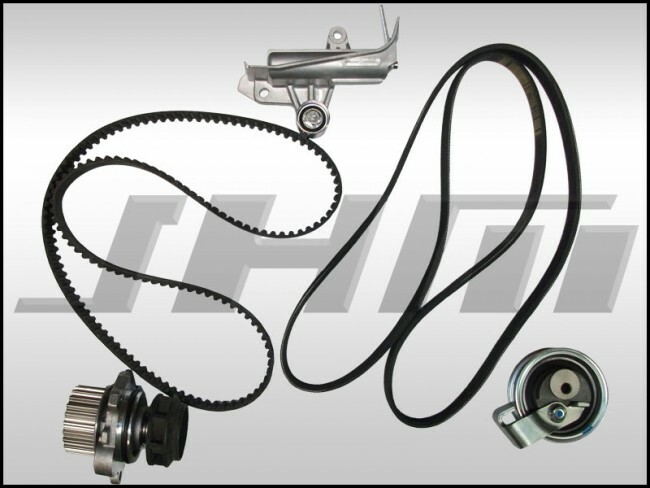 Parts made by the following high quality companies- Water pump (metal impeller Graf or Hepu), Timing Belt and Serpentine Belt(Continental), tensioner(NTN), Tensioner Pulley(INA). All high quality European OE supplier parts. We don't use cheap plastic impeller water pumps due to their high failure rate. Fitment: Late 2004 through 2005 B6 A4 1.8t From VIN #8E 4 191 001. -Cam and Crank Seals: Use the drop down box below to add cam and crank seals.